I read this article and found it very interesting, thought it might be something for you. The article is called 5 Reasons Why The Grand Alliance Won Bihar and is located at https://archive.indiaspend.com/cover-story/5-reasons-why-the-grand-alliance-won-bihar-16559. Five factors – the sway of Chief Minister Nitish Kumar, high voter turnout, vote swing against the Bharatiya Janata Party (BJP), declining vote share of the BJP and talks of reservation and Pakistan by the BJP leaders – ensured a sweeping victory for the Mahagathbandhan (Grand Alliance) in Bihar. The alliance – including the Janata Dal (U), the Rashtriya Janata Dal (RJD) and the Congress – trounced the BJP-led National Democratic Alliance (NDA) by winning 178 out of the 243 Bihar assembly seats for which results were announced today. The social base provided by the RJD and the Congress, along with development in the last decade, went in favour of the Nitish Kumar-led Mahagathbandhan. “The nation has chosen an alternative path for development,” Sharad Yadav, president of JD (U), said while talking to NDTV. Out of all the exit polls, only one by Lalu Prasad himself was the closest (he had predicted 190). “The victory of Grand Alliance will change the course of national politics,” RJD leader Lalu Prasad said. The JD (U) had contested 141 seats in 2010 and won 115 while the BJP had contested 102 seats and won 91 seats. The NDA in Bihar split following the announcement of Narendra Modi as the prime ministerial candidate of the BJP in 2013. The split ended a 17-year old alliance between the BJP and the JD (U). The JD (U) was the biggest ally to quit the NDA; other big allies like the Shiv Sena, the Telugu Desam Party (TDP) and the Shiromani Akali Dal (SAD) continued with the NDA. While the opposition to NDA was negligible in the 2014 Lok Sabha polls, Nitish Kumar was, and still remains, the most vocal opponent of Narendra Modi. The political realignment in Bihar saw erstwhile foes, Lalu Prasad’s RJD, the Congress and the JD (U) form the Mahagathbandhan, which swept the polls. “Vipaksh ka sammaan karenge, majaak nahin udayenge” (We will not disrespect the opposition in any manner),” said Nitish Kumar, who is expected to be the Chief Minister for the third time, while addressing the media today. Bihar is one of the few states that have not seen a Congress Chief Minister for more than 25 years. Regional leaders and regional politics have always been the prime mover in Bihar, which is among the poorest of Indian states. The Grand Alliance was formed as a united opposition against the BJP, which now enjoys a comfortable majority in the Lok Sabha (lower house of the Parliament) while ruling or sharing power in 11 states. The BJP is already in power in three states of the Hindi heartland – Jharkhand, Madhya Pradesh and Chhattisgarh. Nitish Kumar, in the last decade or so, has become the face of changing Bihar. The development in Bihar was propelled by growth in construction, communication, trade and hospitality and the banking and finance industry, according to Economic Survey of Bihar, 2014-15. The Nitish-led coalition matched the progress in economy with equal focus on social sectors – women empowerment and child development. The government led by Nitish Kumar, in the last decade, also implemented 50%reservations for women in panchayats (against 33% previously in village councils) and reservations for the post of Mukhiya (head of the village council). The flagship Mukhyamantri Gram SadakYojana (Chief Minister’s Rural Road Development Scheme) and Manav Vikas Mission 2013-2017 were launched to ensure economic growth as well as improving social sectors. The people of Bihar ticked up a new record for turnout in this assembly election. It surpassed the 2014 Lok Sabha election, which was considered a wave. High voter turnout, which crossed 60% only in three earlier elections, ensured a victory for Grand Alliance. Thus, it was a repeat of history as the RJD won the past three times voting crossed 60%: when Mandal Commission was applied, OBC reservations were in place and Jharkhand was yet to be carved out. Voter turnout reduced consistently after the ouster of Lalu Prasad from power. Nitish Kumar, an opponent of Lalu Prasad, strategically teamed up with the BJP and became the Railway Minister in the Vajpayee cabinet twice – 1998-99 and 2002-04. Since then, he has reinvented himself as a “clean” leader with a mixed support base unlike Lalu Prasad who has received consistent support from Muslims and Yadavs (31% of electorate). With electoral support from the BJP and sparkling administration that showed results in infrastructure and per capita income, Nitish Kumar consolidated a firm rural-plus-urban, multi–class, multi–caste voter base. He became the face of Bihar’s development, and the electorate reciprocated it with a decisive vote. Facing the BJP juggernaut independently in the Lok Sabha elections, the JD(U) on one hand and the RJD + Congress on the other garnered 45% vote share but won only nine out of 40 seats. NDA, on the other hand, got only 39% of total votes but won 30 seats. The present Grand Alliance garnered 42% vote share in the 2015 assembly election and won 178 seats. The NDA won only 58 seats with a 34.3 % vote share. The three major parties of Grand Alliance recorded a low share-to-seat multiplier in the Lok Sabha 2014 election as explained in IndiaSpend’s earlier article. The RJD won 22 seats with 19% vote share in the 2010 assembly election, and won four parliamentary seats with 20% votes in 2014. The JD (U), which won 115 seats with 22% votes in 2010, won just two seats with 16% vote share in 2014. In the 2014 general election, the Grand Alliance won just nine out of 40 seats. The combined share of three parties skewed the seat-share logic this time; the grand alliance actually managed to get past the post than NDA candidates in the right number of seats. As explained in an earlier article, the same voting pattern did hold true for the assembly election, which had given the Mahagathbandhan (if it had been devised) lead in 145 assembly segments in Lok Sabha 2014. The BJP had won a full majority in Lok Sabha with 31% vote share pan-India but NDA failed to win a majority with an increased vote share of 34%. The last two terms of Bihar assembly were ruled by the BJP-JD(U) combine. That combined vote share has certainly swung towards the Grand Alliance. The coming together of top two politicians of the state – one with a history of Mandal politics while the other who transgressed and created post–Mandal development politics – and the Congress has won rich electoral dividends. Election observers/researchers feel that the accord between the candidates of constituent parties and fewer instances of rebellion proved instrumental in Grand Alliance’s victory. The traditional RJD voters – Muslim Yadav (MY) communities – played key roles in re-establishing Nitish Kumar in power. The vote share of the BJP in states increased in the run-up to the Lok Sabha elections (2013 to 2014). The party secured handsome vote share in the assembly polls in states in 2013 – namely Madhya Pradesh, Chhattisgarh, and Rajasthan, and formed governments there. On the one hand, the BJP secured higher vote share in the same states in the subsequent Lok Sabha election. On the other hand, the vote share of the BJP has been declining in assembly elections after the Lok Sabha elections. In all the states, except Maharashtra, the vote share of the BJP has declined in the subsequent assembly elections. In Maharashtra, the support from Shiv Sena was inevitable for the BJP. In Jharkhand, the BJP rules a minority government while in Jammu and Kashmir; they could not surpass the regional party PDP. Getting into power in Jammu and Kashmir was a big achievement for the BJP but it had to settle as a smaller partner in the ruling coalition, courtesy the lower vote share. Bihar was yet another assembly election after the Lok Sabha polls, and the BJP’s vote share has reduced. The vote share of 30% in 2014 Lok Sabha polls reduced to less than 25% in 2015, and the party received a blow winning just 53 seats. Apart from numerical factors and electoral statistics, sociological and psychological undercurrents played critical roles in the Bihar elections. The Bihar campaign started with rants of reversing other backward class (OBC) reservation from the Rashtriya Swayamsevak Sangh (RSS). The communal incident in Dadri, Uttar Pradesh of lynching a person over suspicion of carrying beef raised the issue of gross intolerance. Prime Minister and the BJP star campaigner in Bihar Narendra Modi, rather than assuaging the communal tensions around it, created a new controversy by invoking Pakistan in the middle of the campaign. The Lalu-Nitish combine was deft enough to convince people about the ills of such rhetoric in action, and the people obliged. And obliged powerfully. The Mahagathbandhan excelled in engaging directly with people. Nitish Kumar and Lalu Prasad, deciding not to contest the election, travelled to almost every constituency in the state, with both of them crossing the mark of 200 rallies, according to reports. 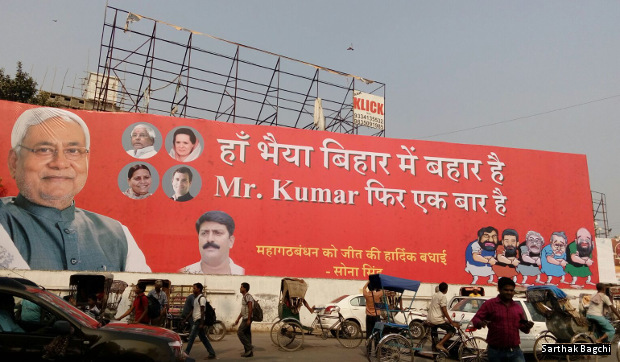 While the NDA combined grand rallies of Prime Minister Modi with local rallies by Ram Vilas Paswan, Jiten Ram Manjhi, BJP leader Sushil Modi and Amit Shah, the Grand Alliance focused only on local rallies by the two leaders. All over India there is difference in voting in national election and State elections. Regional parties tend to get more votes in assembly elections. Would have loved to see comparison of % vote share of prev assembly election and 2015 election.